A year after the Cannery Road Race was cancelled, the 2016 race in Port Edward went off without a hitch. A year after the Cannery Road Race was cancelled, the 2016 race went off without a hitch. Last summer, the race was cancelled due to lack of volunteers but this time, there was enough help on hand over the weekend. Around a dozen people helped the race run smoothly. “The day has been fantastic. We’ve had some volunteers step up that have been phenomenal,” said Leslie Peloquin, who directed the race along with Lynn Daniele. One of the Rupert Runners’ premiere events of the season saw 74 adults runners and around 15 kids test their legs. The kids’ fun run was one kilometre. Although they weren’t timed, everyone was a winner. “We had an enthusiastic group of kids. 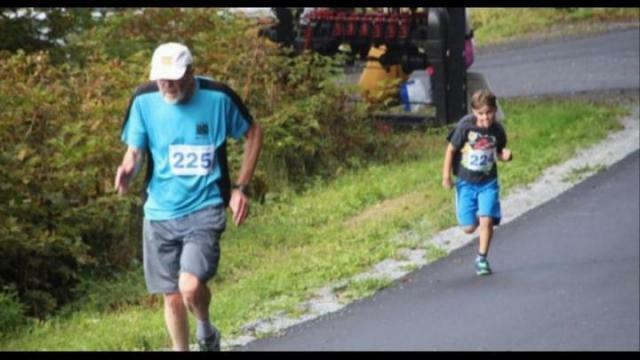 The runners are important too, but it’s all about the kids,” said Charlene Hamilton, treasurer of Rupert Runners, who was helping track the racers’ times as they crossed the finish line. Every kid participating received a cookie medal afterwards. For the adults, there was a five-kilometre run, a 10km and a half marathon, which was 21km. Each race had a different turnaround point on the road, with the furthest one being the Port Edward cutoff. Brent Webb of Terrace, raced across the finish line with the best overall time in the half marathon at 1:36:42. Ryan Staschuk came in second at 1:40:17, but got top honours in the 20-39 male category. In the 20-39 female half marathon category, Shannon Lough came in first with her time of 1:49:09. She was also the top overall female in the 21km. Tracy Moraes turned in a time of 2:27:03, which was best in the 40-59 female half marathon category. In the 10km race, Joe Pelletier, another Terrace man, legged out an overall victory with his time of 40:41. He was also top in his 40-59 male category. Tanis Palmer was the fastest female at 47:46, and in her 40-59 female division. In the 20-39 male category, Marc Monteleone came across the finish line first in the 10km at 47:09. The 5km runners came back first, starting with Lindsay Smith who was the only one to run it in under 20 minutes. His time of 19:25 was the best overall and in his 20-39 male category. Megan Reid of Terrace, was the fastest female at 20:59, and in her 40-59 female division. In the under 19 males, Trai Zips, of Terrace, led with his time of 20:59. Michaela Yeo, also of Terrace, was the top female in that category at 25:01. Helen Joubert was the fastest female in the 20-39 zone, racing in at 31:51. The speediest male in the 40-59 range was James Koch at 24:19. Terrace resident Mike Reid came across the finish at 30:30 to be the top 60+ male. Running wasn’t the only competition, however. There were also 5km and 10km walks. Port Edward native Jan Legaspi did the 10km in 1:32:29 for fastest in that category. Prince Rupert resident Winnie Ikari walked the 5km in 45:06 for top honours in that race.